Scene75 is offering a FREE program for those with special needs. The program has been developed to help improve social and motor skills, hand and eye coordination, reaction time, and recognition… all in a safe, controlled and FUN environment. If you’re planning to come to our next FREE Special Needs Day please register below! UPDATE: Special Needs Day has been updated to be a Bi-Annual Event occurring in May and October of each year. Our next Special Needs Day will be in May of 2019. If you have any questions about this change, please send us an email here. Why is Scene75 offering this unique Program? Research has shown that video gaming can help develop social and motor skills, improve hand/eye coordination, reaction time, and recognition. What Different activities are available to build skills? A $10.00 Arcade Game Card granting access to play any of our over 100 arcade games. Arcade games help with reaction time, hand and eye coordination, recognition, and motor skills. 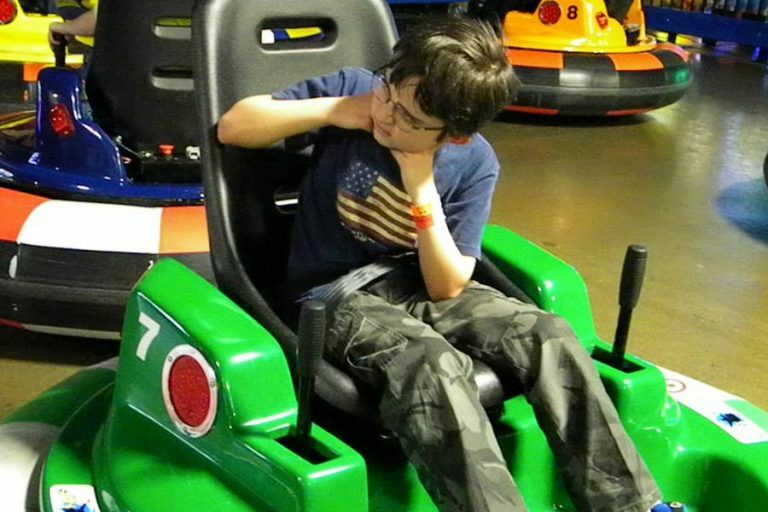 One Spin Zone Ride – A fun dodge-car experience that helps with reaction time, recognition, as well as motor and social skills. Nine Holes of Black Light Mini Golf in one of our two themed courses. Mini Golf helps with hand/eye coordination, social skills and motor skills. 30 minutes in our Chaos Room (Only available in Dayton & Cincinnati) interactive gaming roomto help build motor and social skills, recognition, reaction time and hand/eye coordination. The Chaos Room is an interactive gaming theater where you can play video games on 15-foot HD projection screens online or offline. Siblings can, and are encouraged to, participate to make things easier and more comfortable for the individual with special needs. However, attractions for siblings are not free. Siblings can purchase the same game card for a discounted price of $14.99 each. Parents and/or Guardians are required to stay and help the person with special needs. There must be no more than 4 special needs individuals for every chaperone that comes.It will make the person with special needs and the Scene75 Staff Members more comfortable, making the experience more enjoyable for everyone! The first Thursday in May and October every year. There is no age restriction on the person with special needs. Scene75 is proud to partner with local schools to incentivize and reward academic excellence. Two organizations truly recognize the value in the other and get creative on how they can help each other achieve their goals. Calling all ghosts, goblins, princes, and fairies! Check out Scene75’s indoor trick or treat event, a safe night full of treats and no scaries! Partnering with the national Toys for Tots program Scene75 collects toys from December 1st through December 24th. Scene75 is a proud supporter of our local Children’s Hospitals and is deeply involved with their causes throughout the year. Scene75 has partnered with Cleats For Kids to encourage kids to get out, be active, and play sports. Once a month, Scene75 welcomes these big sibs and little sibs to have a day of fun. Entrepreneurship and business are part of what make America great, but no one said it was easy. Let's see how Scene75 can help you with your cause!